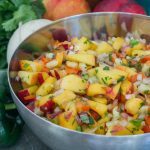 With so many great fruits and vegetables ready now, nectarine salsa is fresh and easy! 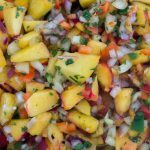 Great on fish tacos, grilled chicken or straight-up with chips, nectarine salsa will be the star of the dinner table! Hi! It's me, Raj! 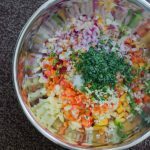 Though this is Holley's recipe, I wanted to hang out with you today. Holley talks to you all the time on social media, and I'm trying to have a bit more of a presence on Instagram as well, but I wanted to say hey and let you know what's going on. Now that Game of Thrones season 7 is finished (don’t worry, I’m not going to spoil anything – I HATE when people do that! ), there is a massive hole that needs to be filled, don’t you think? So it’s the perfect time to start the next 30-day challenge! What do you think? Huh? Huh? Come join us! It’s something different that should be a lot of fun. I wrote a bit about Primal Play here. I’ve done a couple sample workouts that are low-impact, but a hell of a workout! One of the reasons that doing the Primal Play challenge right now is perfect is that you can do it anywhere, and currently, I am homeless. Or home-ful, depending on how you look at it. Remember that great space I moved into last year? Well, it's time to move on. My stuff is in storage, my trunk is full, and I'm bouncing around. I'm starting off with some house/cat-sitting, followed by some couch-surfing. And then… Unknown! Honestly, it's kind of exciting! I'm getting the chance to connect with some old friends who I haven't seen in a while. At the same time, I'm meeting lots of new people and exploring areas that I haven't been in or haven't explored enough. And of course, there is a lot of great food involved, including an amazing pot-luck brunch yesterday (I brought some vegetables, crispy potatoes, and the magic fenugreek sauce which was a hit!)! Another cool thing about this is that I get to see and experience some really neat living spaces! And I discovered a few websites that connect people looking for house/pet-sitters with people like me who would look after their place. Not only that, but you can do extended travel this way! Why didn't I think about this years ago? I have yet to use the couchsurfing.com website. Have you used this or know anyone who has? This flamingo, “Flamy”, creepily snuck up behind me. When my friend pointed it out, Flamy sort of back-stepped to where it had been hanging out before… Eerie! Also, this otherworldly light is due to the smoke from wildfires. If you've got a place that you need me to look after for a couple weeks or months, get ahold of me! It's that time of year! Fresh stone fruits are ready! 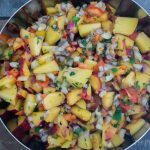 You may remember my Peach Avocado Salsa from a while back (as good now as it was then!). 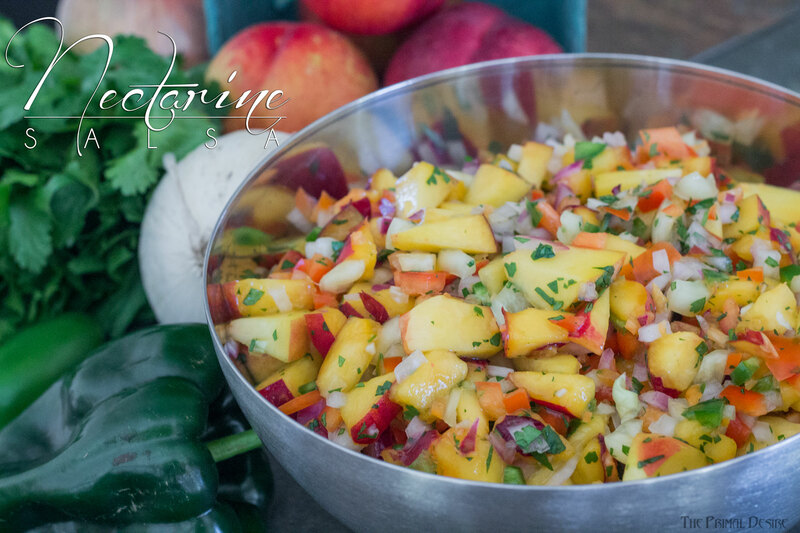 Holley has put together this Nectarine Salsa that is so fresh and so clean, clean. It really awakens your mouth! If you follow us on Instagram then you may have seen the paleo tortilla chips that we got the chance to try. Of course, we haven't been able to find them in Canada yet (except on Amazon). So when we were in Oregon a few weeks ago for the solar eclipse totality (if you ever get the chance, I recommend that you take it – even at 95% coverage you won't have the same experience as the totality), we picked up $30 USD worth of Siete grain-free tortilla chips. Totally worth the price! Well, I think that was a nice visit. I hope you're well. Don't be a stranger: let us know what's going on with you. Did you see the eclipse? Do you have any big get-togethers coming up? Been to any epic potlucks? Are they called potluck meals where you are? 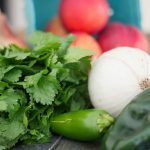 Maybe I'll make this salsa for my current hosts today! Combine all ingredients, and let sit for 5 minutes. This is amazing with Siete paleo chips! Perfect opportunity to explore your neighborhood! LOVE this! My mouth is watering – I would seriously eat this with a spoon!! I LOVE nectarines!!! This salsa is totally my kind of salsa. I wish I had some of this to snack on tonight with some plantain chips. Yum!!! I love the addition of nectarines in this recipe! I love mango salsa so I bet this is just as good. Bookmarking so I can try it out! Thanks Jean, hope you like it! Now I wish I had eaten more nectarines this summer! We are still getting peaches at the farmers’ market, so I’m going to get some this weekend. Thanks for the recipe and inspiration! 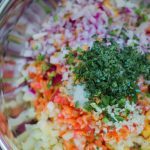 Makes sure to check out the peach avocado salsa link at the top of the page! What a refreshing, gorgeous recipe!!! 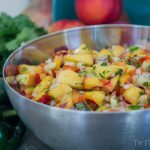 Love fruit salsa in general, and now that nectarines are still in season, this would be perfect to make on the weekend. I love me some fruit salsa. I’ve never made it with nectarines so I’m going to have to make this and devour it! Simple and delicious. I love it ! Did Gerald act all creepy too? Maybe that’s just how flamingos behave…. I love fruit salsa. I’m definitely going to have to try this. YUM!